Musk envisions motorists' vehicles being lowered by elevators into tunnels and onto electric sleds that whisk them along to destinations. 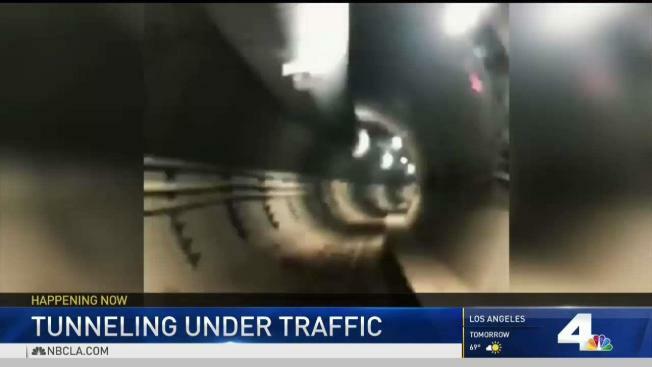 Elon Musk said in a tweet Thursday night that his first tunnel under Los Angeles is almost complete and he expects to offer free rides to the public in a few months in a "quest for a fantastic future." The tunnel is a novel underground transportation system that would whisk people to and from locations underground, below LA gridlock. In a tweet Thursday, Musk, the CEO of Tesla and SpaceX, touted the tunnel and thanked supporters. "Super huge thanks to everyone that helped with this project. Strong support from public, elected officials & regulators is critical to success," he wrote. Last month, members of the LA City Council's public works committee said they wanted to approve any proposal that could help untangle the city's notorious traffic gridlock. He envisions motorists' vehicles being lowered by elevators into tunnels and onto electric sleds that whisk them along to destinations.